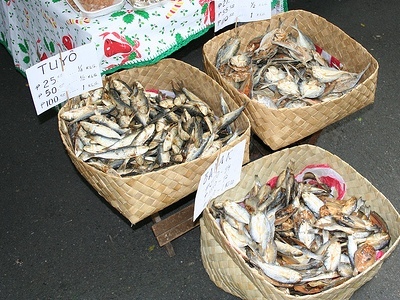 Tuyo is a dried salted fish (tuyo actually meaning dried) in the Philippines. Tuyo has been tagged as a poor man's kind of dish as can be procured quite cheaply (and as it is "preserved" can be stored cheaply too!). Poor man or no, tuyo has many fans from all walks of life, so I want to say that Tuyo is an everyman's kind of dish. And as far as tuyo lovers go, I am of the them who head to eat Tuyo for breakfast. Tuyo is served during breakfast with fried rice and sunny-side up eggs. Very popular in the Philippines. Some eat all of the Tuyo isda from its head to tail and bones. Because tuyo is salty , its aroma can fill up the whole house and could extend to the neighborhood. Others said that it has a bad smell. But when the scent of tuyo is smelled, everybody else would be tempted to eat. Very great with vinegar for a dip.